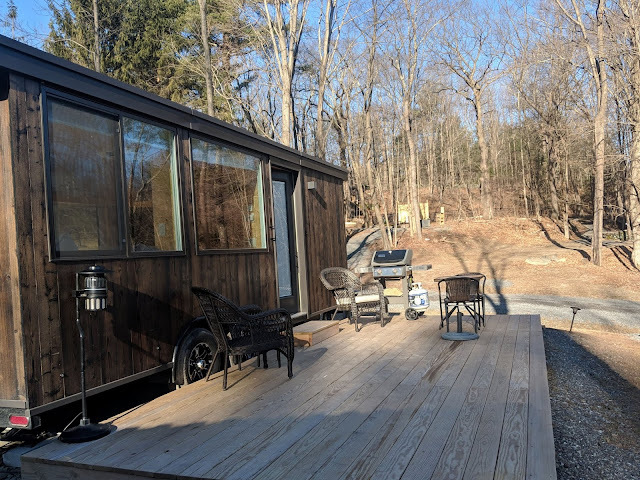 By some stroke of luck, I ended up winning a weekend away at this Tiny House Resort in the Catskills thanks to "The Gram". 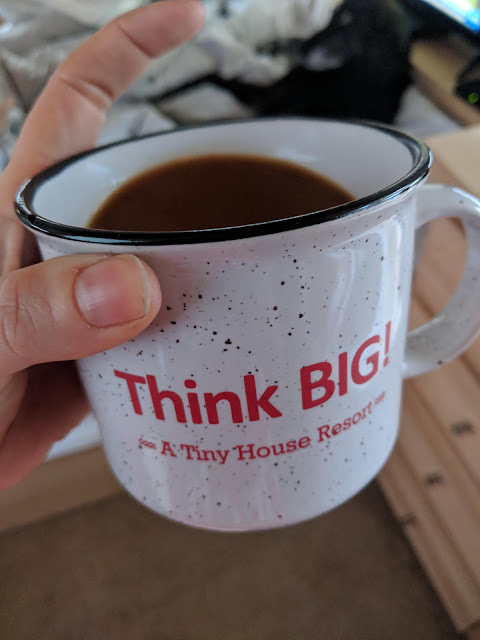 As I squealed with excitement on finally winning something, I began to envision a simple March weekend in the Catskills, Sunday morning waking up in about 200 square feet in a quiet little tiny home nestled in the woods. 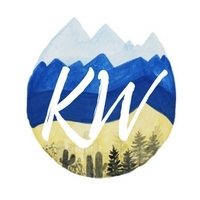 A few casual hikes, explore some towns, eat at some new restaurants and relax before the busy summer season kicks in. No fancy hotel or big plans needed. 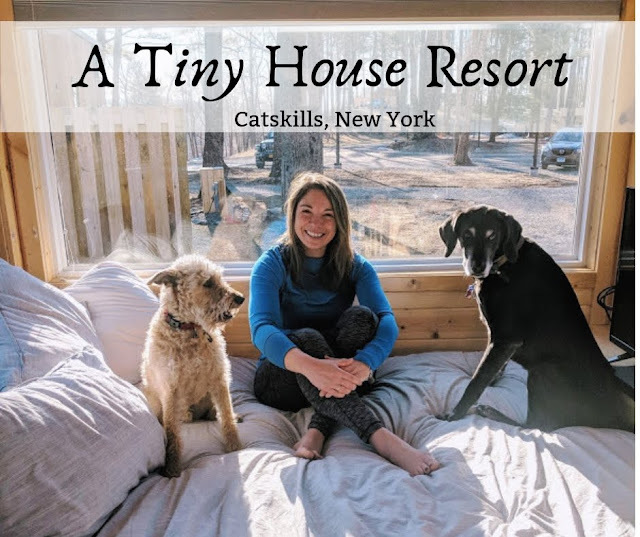 Some require five stars hotels (I'm talking about you mom) but I crave the simplicity of a tent pitched in a quiet corner of the woods or in this case....when snow is in the forecast and you want to be in the woods but warm, a dog-friendly tiny home resort nestled in the Catskills. Before we talk about this resort, let me walk into the confessional. I have to admit, I went into this weekend a little skeptical. When I invited Adam I kept saying to myself and to him "this was free! Even if it's not what I expected or dumpy or just plain weird.... it was free and it will be a funny story to tell down the road". I went into the weekend with no expectations and a good sense of humor. Well let me tell you dear reader, my expectations were blown out of the water. From the tiny homes themselves to the entirety of the resort - I Was Impressed. These Tiny Homes were everything you needed (and a whole lot more) and were so well thought out. 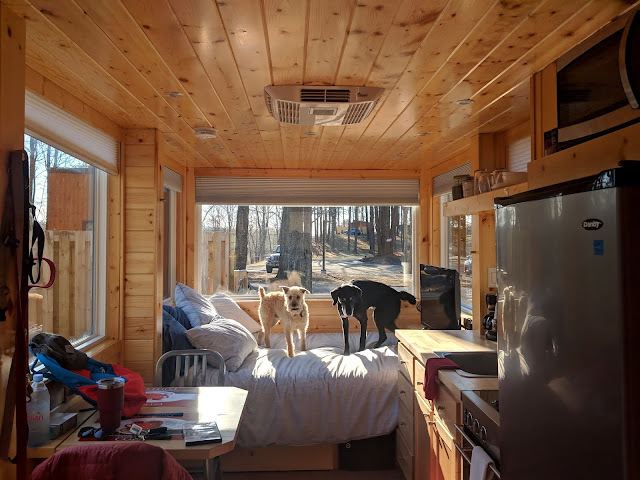 Simple yet luxurious living in about 200 square feet where the focus is on togetherness, epic lighting, woodsy views, and relaxing - it was a pretty perfect weekend in The Mocha. This tiny home was an impressive little haunt with its windows for days, cleanliness, updates and details. And what I wasn't expecting? How awesome the entire resort is. The beauty of this spot extends beyond Mochas four walls and wooden deck. 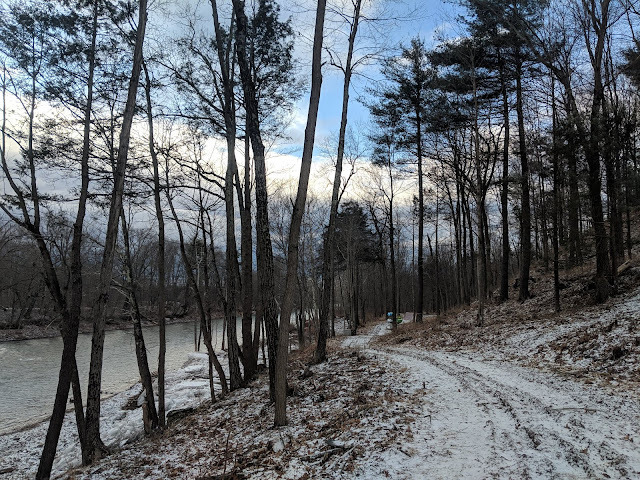 The resort itself covers a beautiful wooded area right along Catskill Creek. The resort is home to chickens you will likely see roaming the property in the morning (complimentary farm fresh eggs at the check-in office included). 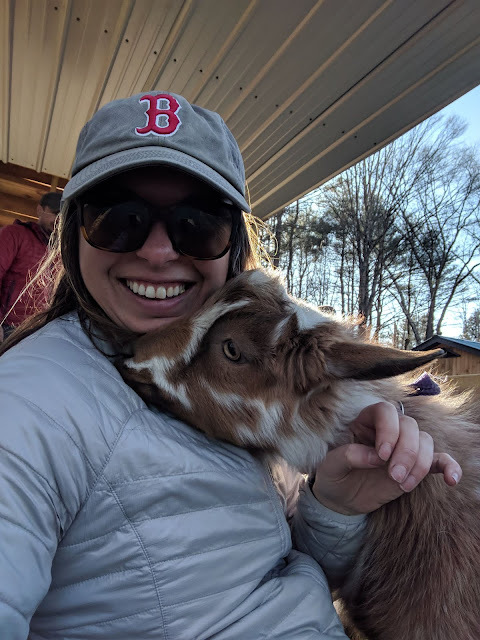 There is a goat pen and you are invited to walk right in and snuggle up with a whole bunch of adorable baby goats - an activity not to be missed. There are daily Goat Walks around the property so don't be surprised if you find some goaty guests at your patio begging for attention and snacks. If you come in the summer, you can enjoy the in-ground pool and kayaks available to borrow and launch right in the creek below. 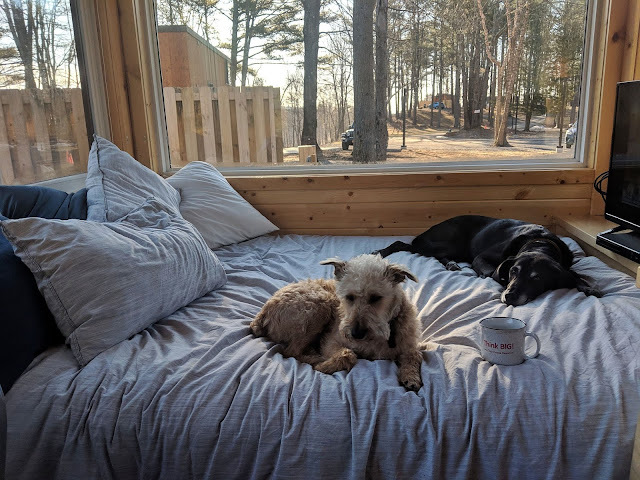 There is a dog park for the four-legged guests and various hammocks and benches along the property. Heck, there is even a waterfall you can hike out to for some serenity and a good photo. And yes you social media junkies and those used to luxuries- each Tiny Home comes with its own WiFi network, toasty heat for cold winter nights and AC for those hot summer days. It is luxurious living in The Mocha. The tiny homes themselves are pretty spread out throughout the property and privacy walls are installed where needed. You can find little structures around the property offering firewood for sale and even little shed called the Snack Shack. Forget something? The Snack Shack has it. 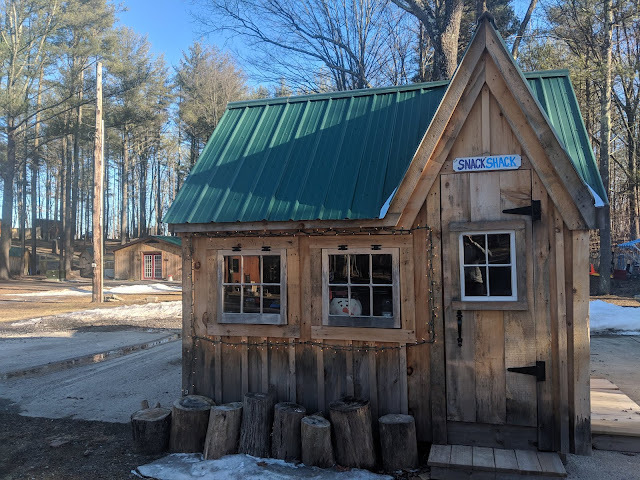 Inside this cute little shed you can find snacks for sale and everything you could possibly need: toothbrush, coffee mugs, hair brushes and local soap even. You can also find various items to borrow including movies, more kitchen appliances, and board games. Marjorie and her mom thought of almost everything when they designed this resort. 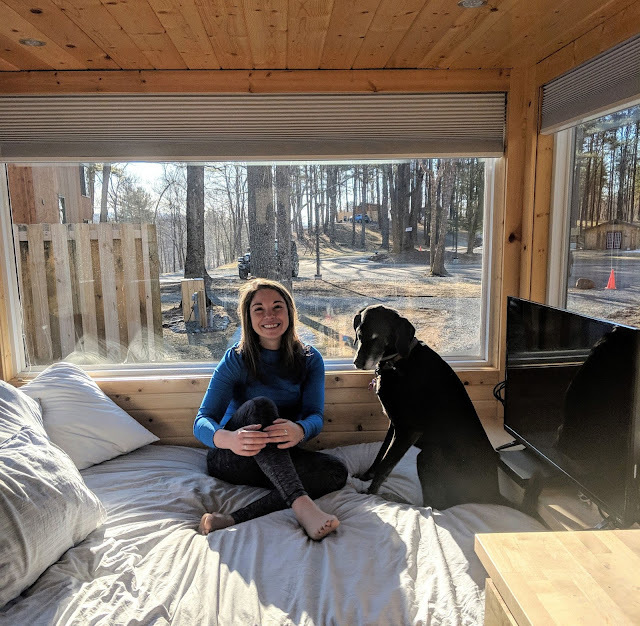 A tiny home on a resort stocked with outdoor activities, friendly goats, board games and fresh eggs. Simple perfection if you ask me. 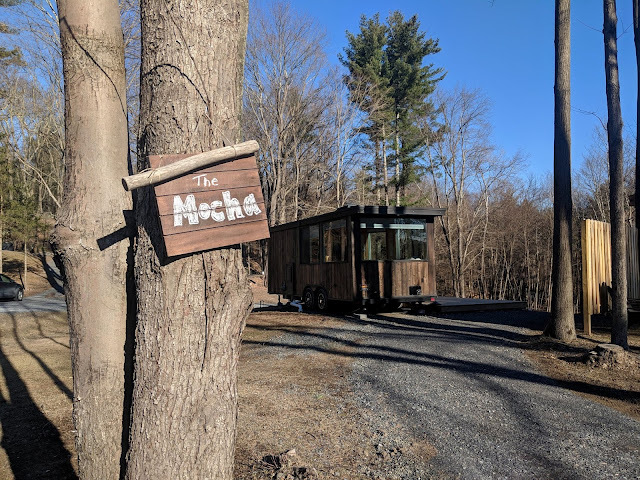 The Mocha was the perfect home base for a relaxing weekend in the Catskills. It offered everything I needed and nothing I didn't. But - if you are looking for a little more, you can find that here too. Some tiny homes are small and simple, and some are impressively detailed high-end miniature homes. 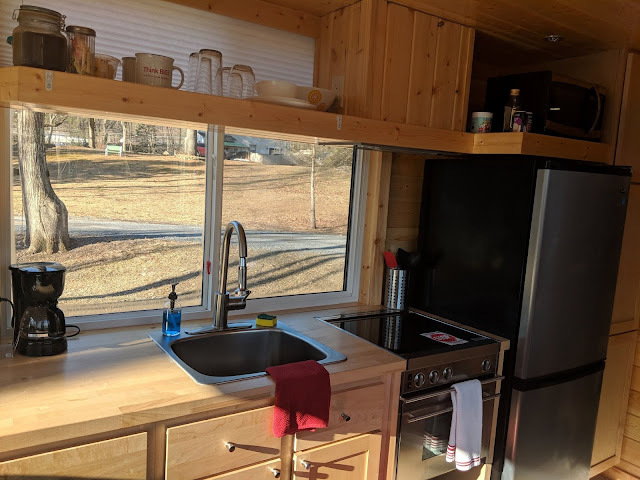 There are two story tiny homes decked out with granite counters, an electric fireplace and a table for four. The Oki (yes they all have adorable names) actually has a queen bed, a twin loft, and a pull-out couch. Yes, you just envisioned you and your friends in the Oki playing Scrabble, didn't you? These tiny homes and this resort sort of blew my happy little mind. It was so much more than I expected and I was so impressed with the attention to detail, cleanliness, and amenities. I do have to include, this may not be a budget friendly item as they come at a high price. A night in The Mocha will cost you about $275 a night on the weekend with a two-night stay costing you about $704 with the service and cleaning fee. Add in a $25 dog fee (per dog) on top of that and it ends up being a pricey weekend. But for the quality of the houses and the resort, you get what you pay for and a nice weekend at a nice resort that is centrally located is not cheap. I would come back here in a heartbeat and I can't recommend these tiny homes or this resort enough. 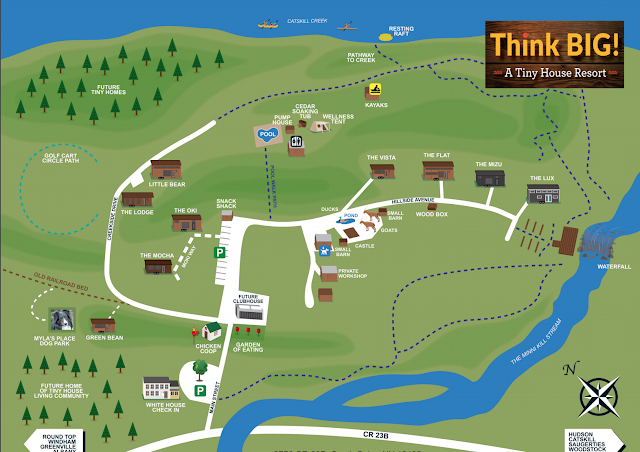 Its location is perfect for a weekend exploring the area and stay tuned for my trail guide to Kaaterskill Falls (20 minutes away), North-South Lake (25 minutes away) and the surrounding quaint and trendy towns (Hudson, Saugerties and Woodstock). and expect to see us again soon!